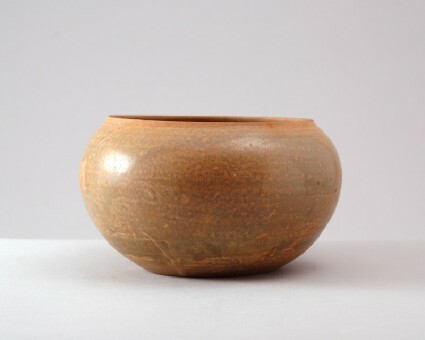 Related bowls and dishes were made in southeastern China in the 5th and 6th century AD, see Zhongguo taoci quanji [Complete series on Chinese ceramics], vol.4, Shanghai, 2000, pls 200 and 217, but the present piece appears to be a later version from the Changsha kilns. The globular bowl is shaped like an almsbowl, with flat base and incurved rim. It is undecorated and covered overall with a yellowish-green glaze which has slightly degraded and discoloured through burial in red earth. It was fired standing on five small bar-shaped spurs, with another piece placed inside it, raised on four dot-shaped spurs, all of which have left marks in the glaze.